Several regional rope rescue teams were brought to the Kummer Bridge (36800 Enumclaw-Black Diamond Road SE) yesterday at 4:30 PM after an adult female fell approximately 60 feet from a trail above the Green River. The woman, who only suffered minor injuries, was with another person when she slipped off the trail that runs under the bridge. Fortunately, the woman did not fall all the way to the water. When firefighters arrived, they found an adult male on the bridge who led them to the patient. The woman was able to talk to the first responders when they called down to her. The first team to rappel to her confirmed that she had no life-threatening injuries. 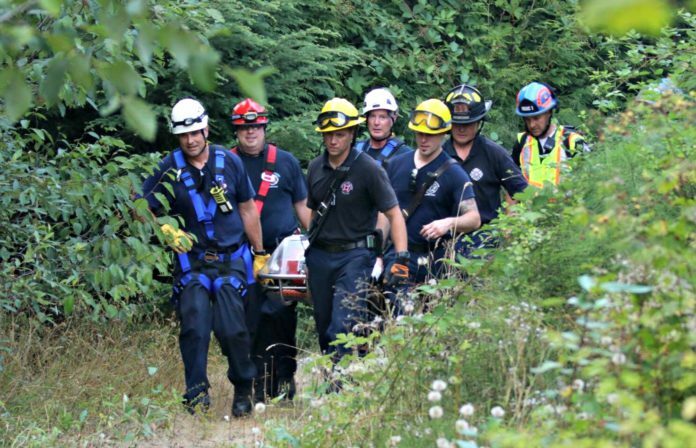 It took the rescue teams approximately one hour to get the patient back up to the trail using a hoisting system due to the heavy brush and trees growing on the hillside. Over ten technical rescue firefighters were part of the incident. The patient was transported to a local hospital by ambulance after being evaluated by King County Medic One. This was the second rescue in recent days at the bridge. On August 1, two teens and two adults fell from the trail in the same area. Those four also suffered only minor injuries, but had to be brought back to the trail by firefighters using a hoisting system.